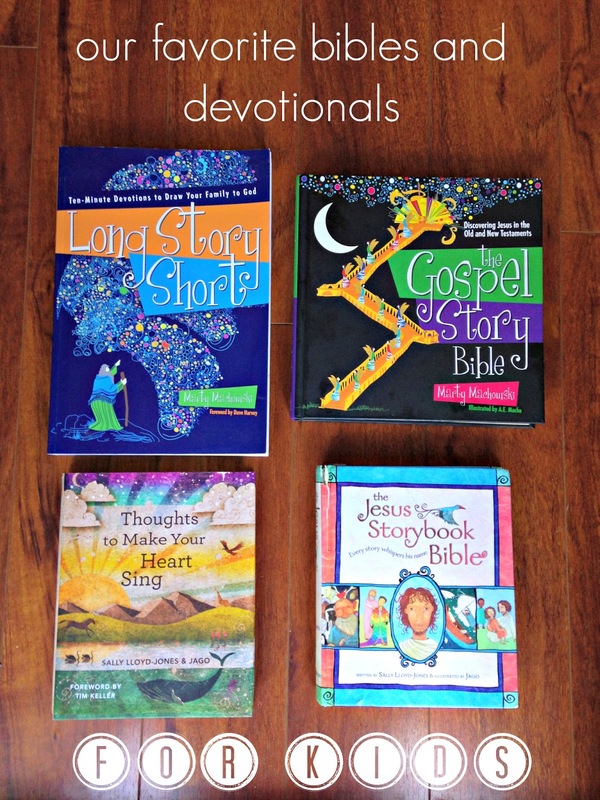 A couple months ago some of you asked what Bible we were using when we made our resurrection rolls so I thought I'd share some of our favorite kids Bibles and devotionals. These 4 of our favorites. The Jesus Storybook Bible and their devotional "Thoughts to Make your Heart Sing" are my personal favorites. Let's take a look at The Jesus Storybook Bible first. The pictures (by artist Jago) and the creativity in the layout of the pages is fabulous. I love how some of them are vertical and the perspective is unique. And it is really engaging and easy to read (or listen to). It is simple yet profound, funny and most importantly it always brings everything back to Jesus. The publisher says that it is for kids 4 and up but our 2 year old loves reading it too. We keep ours in the kids bedroom and read it to them before bed at night. Here's a little shpeel I grabbed from their website. The Jesus Storybook Bible tells the Story beneath all the stories in the Bible. At the center of the Story is a baby, the child upon whom everything will depend. Every story whispers his name. A Bible like no other, The Jesus Storybook Bible invites children to join in the greatest of all adventures, to discover for themselves that Jesus is at the center of God’s great story of salvation—and at the center of their Story too. Next up is the devotional "Thoughts to Make Your Heart Sing". I love that each devotion is relatively short (most are one page) but that they are still really good. We read it during breakfast and then spend some time discussing it. It has great info and prompts good discussion. The Gospel Story Bible and The Long Story Short are also a great Bible and devotional pair. The pages of The Gospel Story Bible are bright and the content is more in depth, detailed and lengthy. I love the Let's Talk about it section at the end of each story. It helps gets you and your kids thinking about what they read and it allows you as the parent to help make sure they really "got it". "It is easy to forget Jesus in the midst of frantic schedules, family squabbles, and conflicting priorities. But the truth is that he is the hero of every story, including these ordinary ones. This is why Marty Machowski puts God's plan of salvation in Christ on continuous display in The Gospel Story Bible. The easy-to-read storybook introduces your family to many captivating people, places, and events from the Bible's Old and New Testaments, showing how each one ultimately points to Jesus. As you share these Bible Stories together, you and your family will meet Jesus and learn a new, life-changing way of recognizing Christ as the hero of every story." Long Story Short is a great devotional. It shows how every story in the Old Testament points forward to God's story of salvation through Jesus Christ. And it has a little something to talk about with the kids five days of the week. The publisher recommends it for ages preschool through high school. Oh and I should mention that it goes best with the Gospel Story Bible. Hopefully you guys found that helpful. I know there are some great kids Bibles out there. custom paper writing services can easily improve your career.